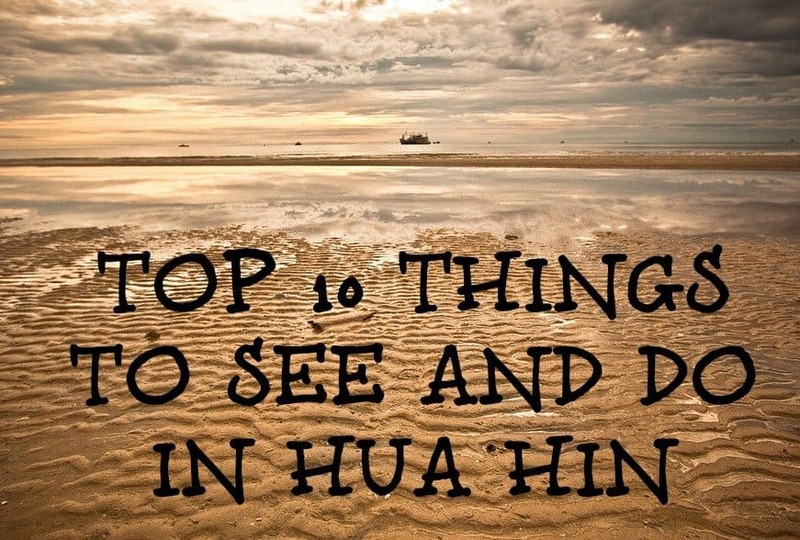 I spent some time researching which hotel to stay in once we decided on Hua Hin as our holiday destination. And, with over 130 hotels in the area, narrowing down the options was challenging – there are plenty of stunning properties to choose from. 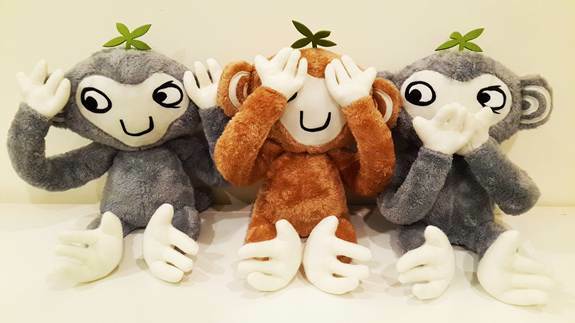 As soon as I saw the Rest Detail Hua Hin’s logo of The Three Wise Monkeys – see no evil, hear no evil, speak no evil – I knew this boutique hotel would be the ideal place for us to unwind. 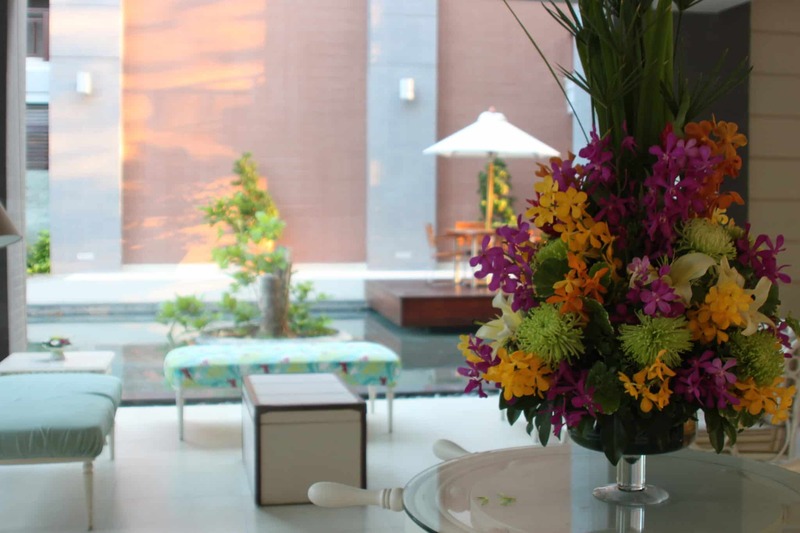 The staff at the hotel are there to take care of the little details so you, the guest, can relax. It’s a simple ideology, but one they do very well. 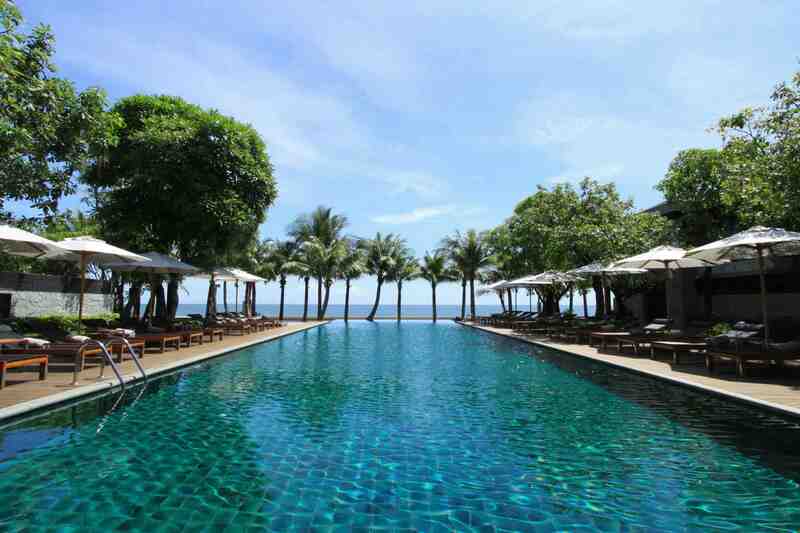 On our arrival, walking into the open plan lobby, we were overjoyed to be met with views of the swimming pool and of the Gulf of Siam beyond. It was then welcome relief to be sat down on a sofa, given cold towels and iced tea to drink after our mammoth journey from the UK. I admired the surroundings – the calm interiors, evoking a Miami beach house ambience with cool jazz playing in the background. Even the staff were dressed in stylish uniforms. But amongst all the elegant splendour, what struck me instantly was the sense that Monkey wouldn’t feel out-of-place here, he wouldn’t be hushed or told to stay away from the plush furnishings. 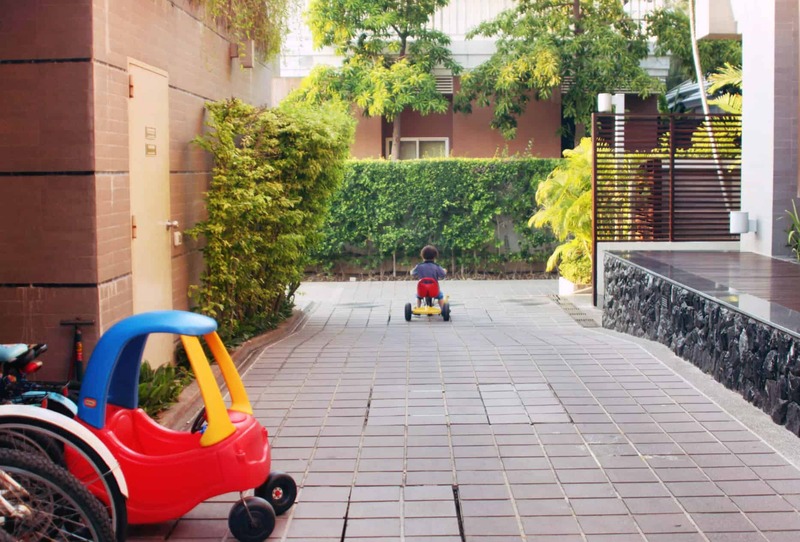 Small but noticeable touches such as the children’s trikes parked up outside the hotel; the cupboard filled with games; the extensive children’s DVD catalogue – free to use at any time; and the wooden charm bracelets that were given to each of us, wishing us a peaceful and happy stay. 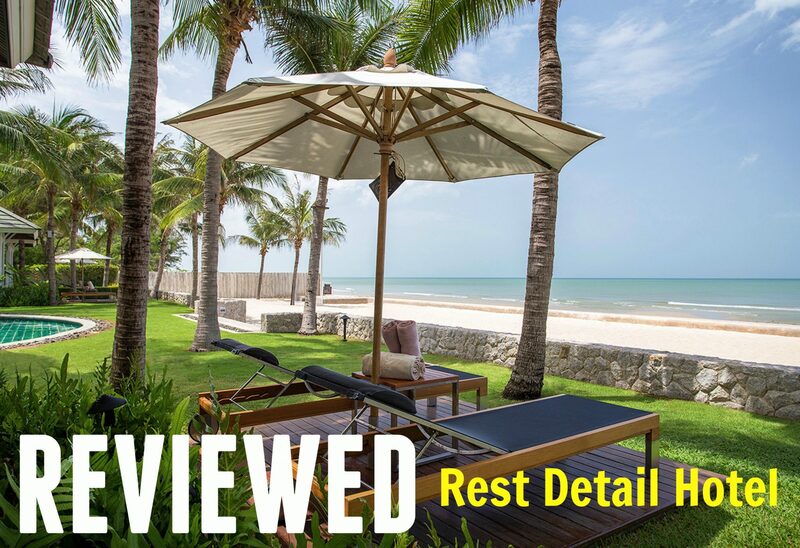 The Rest Detail Hua Hin is a small hotel in comparison to some of its neighbours and comprises of around 40 rooms from standard to private jacuzzi rooms, and a separate pool village flanked by individual villas. What was so appealing about it was the intimacy of the building and its surroundings – not a high-rise in sight. 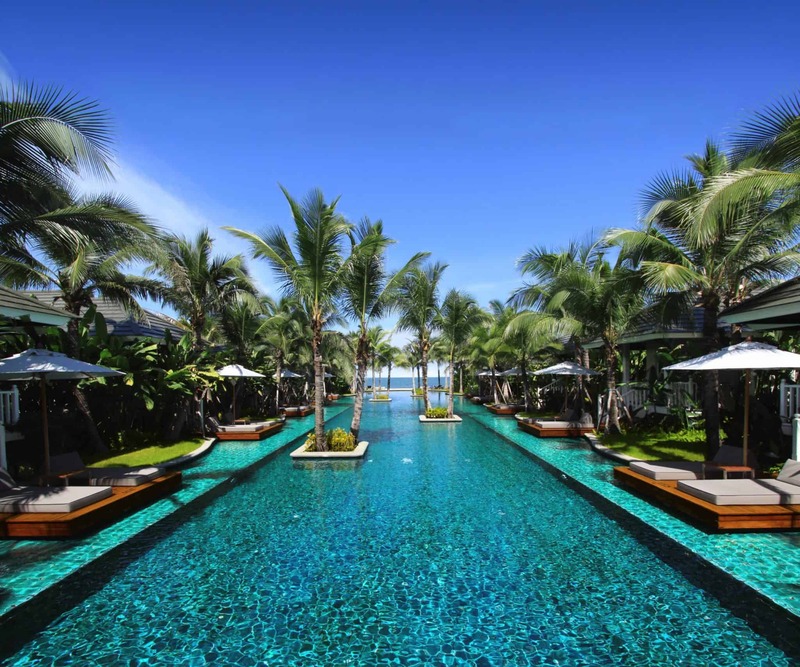 The main feature of the Rest Detail Hua Hin is its main pool, which is the setting for the hotel’s restaurant, the Rest Scene. At night, small, twinkly lights line its perimeter, which makes it a gorgeous, romantic setting to enjoy an evening meal and a cocktail or two. Past the pool, Hua Hin beach can also be easily reached via the stone steps, but because the tide comes in quite far, the sand isn’t as soft and powdery as it is further up the coast. 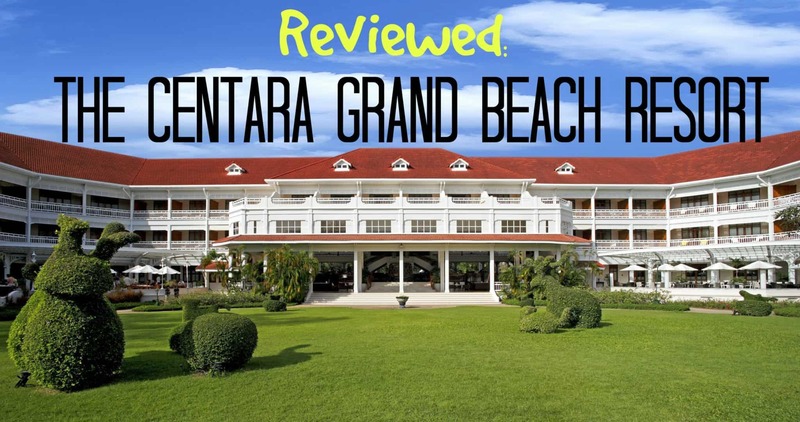 We strolled along the beach occasionally, as well as building sandcastles, but that was the extent of our time on it – we much preferred to stay around the hotel’s tranquil pools. 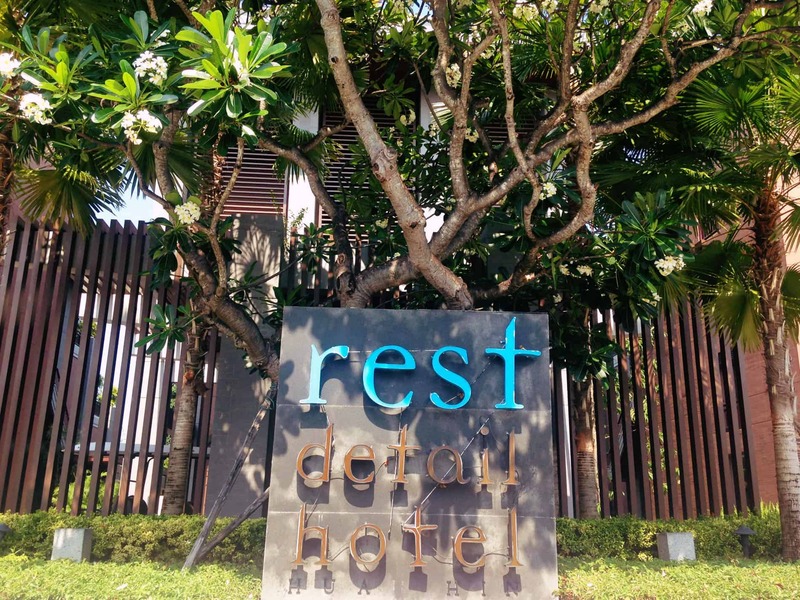 The hotel isn’t set in the centre of Hua Hin and there isn’t much in the way of shops or restaurants within walking distance, but that’s the beauty of it. 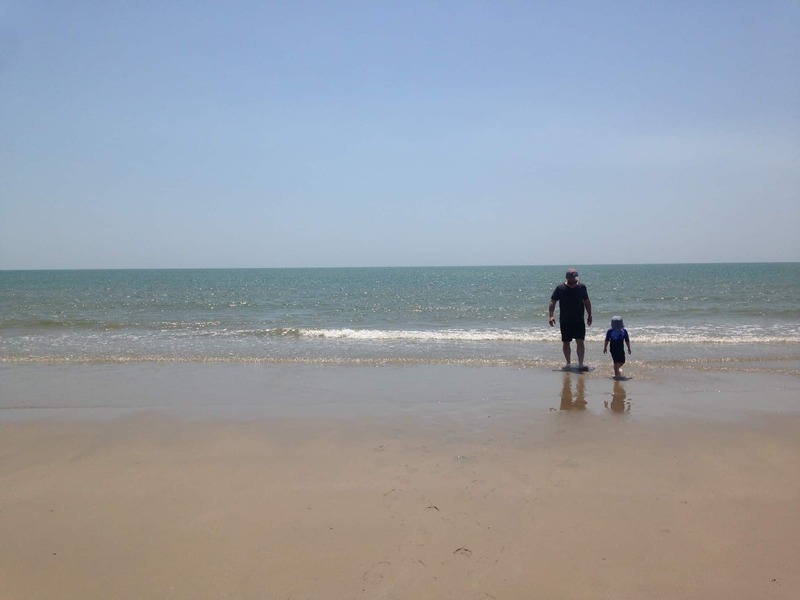 We liked being far removed from everything and enjoyed the sense of escapism… For a few days anyway. When we wanted a change of scenery it was easy. 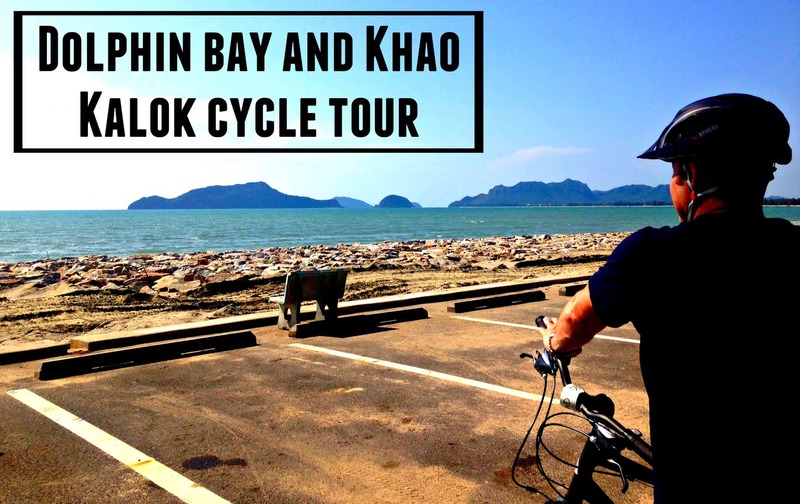 If you need to get into town – which is only 10 minutes by car – then a free shuttle bus (bookable in advance) runs throughout the day, taking guests to and from the famous Hua Hin Clock Tower, or to the Market Village, a huge shopping mall. Our usual routine was to get the shuttle bus into Hua Hin for dinner, and then get a tuk-tuk back for 200bhat (£4), as the last pick-up was at 8.15pm, which we felt was a tad too early. 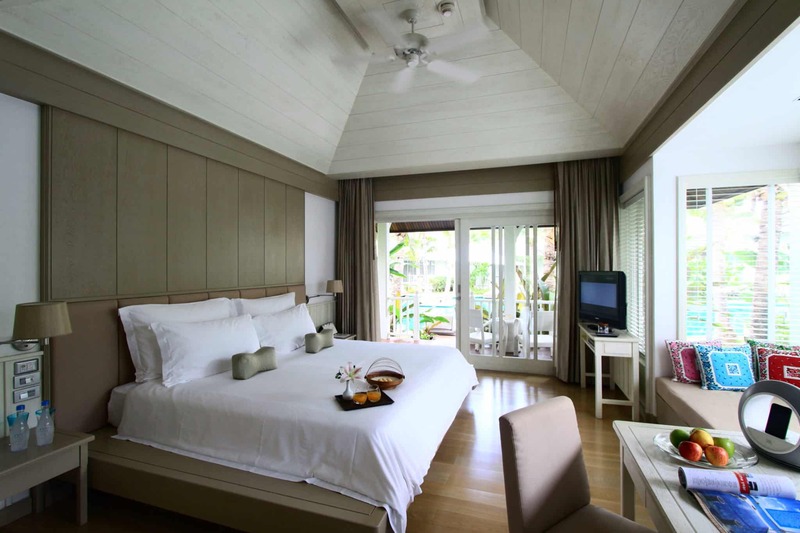 We were lucky to be able to experience two of the hotel’s most premium and popular rooms. Our first few nights were spent in the hotel’s Rest Horizon room – perfect for couples wanting some privacy and romance, and absolutely ideal for a three-year-old boy who wanted to splash about and play with his toys! 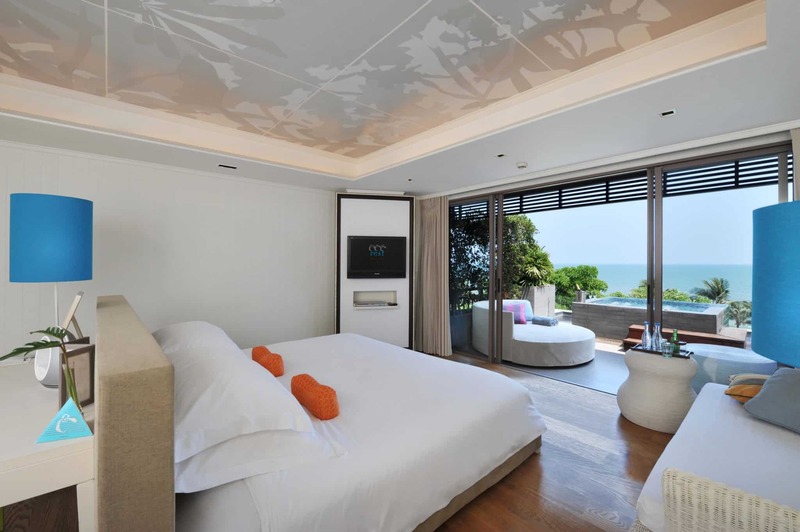 The large, bright and airy room had an outdoor terrace with a jacuzzi pool, day bed and stunning sea views – as well as a large bathroom with a separate rain shower cubicle and free-standing bath. As you would expect from a top hotel, it had all modern features including a mini-bar and tea-making facilities, flat-screen TV, DVD player and iPod dock. Meanwhile, the sheets were crisp and white, the huge king-sized bed was very comfortable, and Monkey slept very well in the bed that was made up for him. The outside space was a real sun trap during the day, so at its hottest points, we would retreat to the shade of the main pool, preferring to relax on our terrace mid-to-late afternoon when the temperatures cooled slightly. It was impossible to get Monkey out of the ‘bubble’ pool, as he called it. Bathrobes, slippers and flip-flops were provided for us to wear, even in Monkey size, as well as a snazzy beach bag to use. Meanwhile, there were plenty of gorgeous smelling toiletries in the bathroom – my favourite being the lavender bath salts. 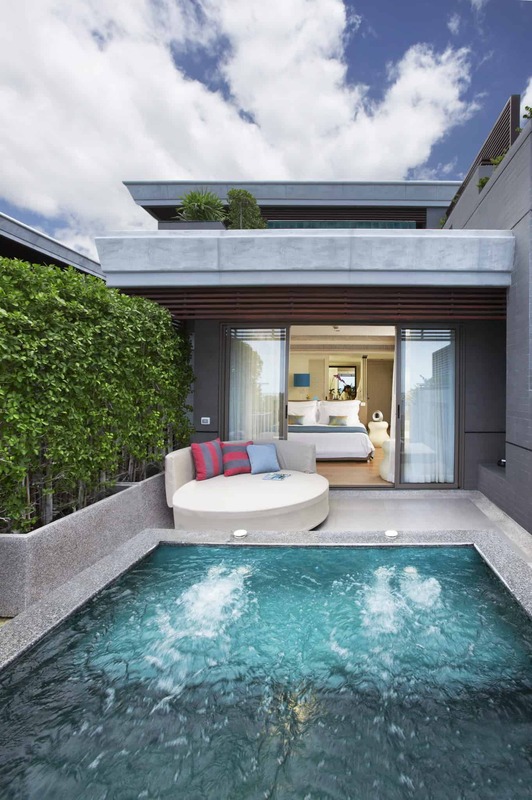 The hotel kindly upgraded us to a Pool Village Villa – and we are so grateful they did. Overall, the size of the rooms were larger and, although it had all the same features as the Rest Horizon, the decor was more muted in tones. However, what made it stand apart from the previous room was the location. 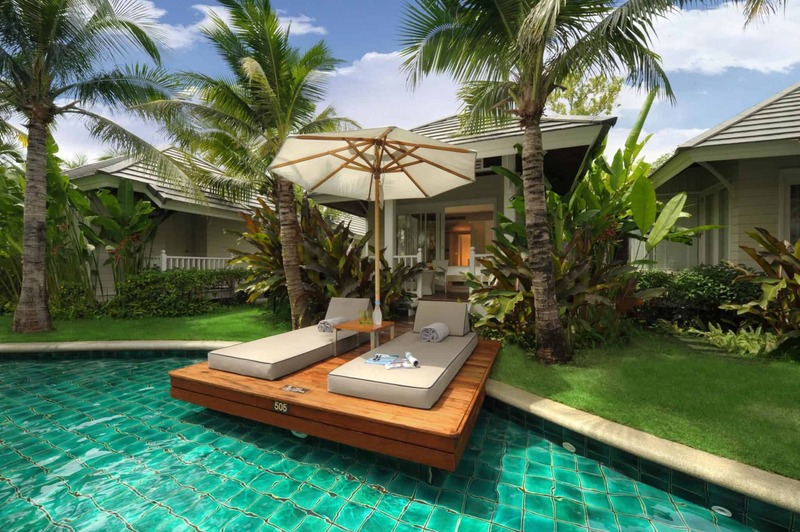 Stepping out onto a shaded verandah, we overlooked a stunning swimming pool and had our own personal sunbathing deck that overhung the water. The village pool is totally separate from the hotel’s main pool, and only residents of the village have access to it. 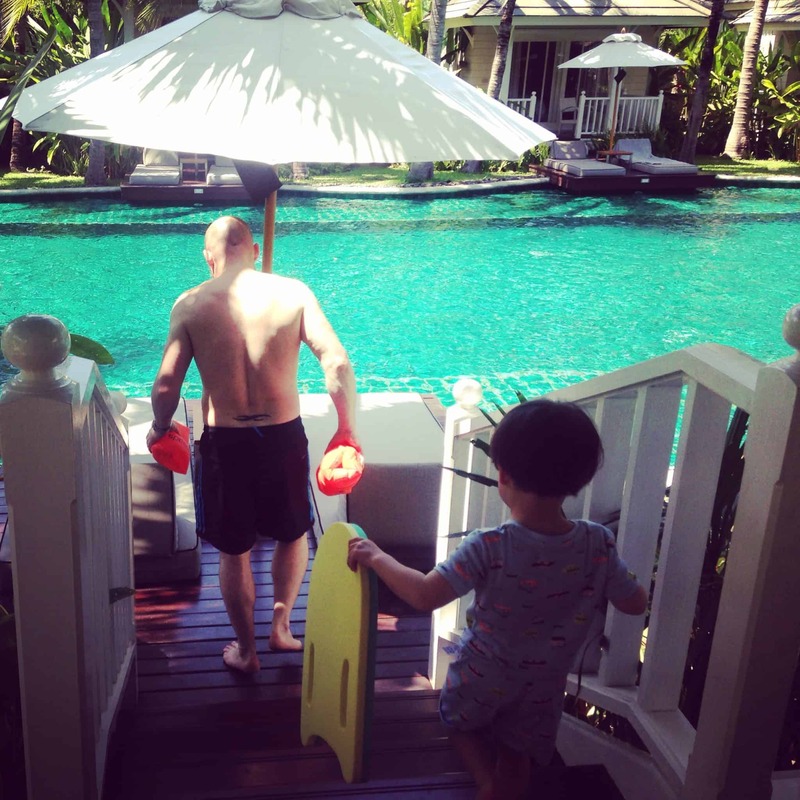 It was easy to get into the pool via the shallow ledge that runs along its entire circumference, but it was also safe for Monkey to splash about in, without his armbands. It was lovely seeing other children enjoying the water, too, but large enough for everyone to have their own space. We loved it here. It felt like our own private oasis and whenever we needed anything from our room, it was fantastic having it so close by. I found it particularly lovely swimming up to the end of the pool and just looking out to sea. Paradise. The food choice was extensive. Breakfast was a veritable feast on both the eyes and the stomach. 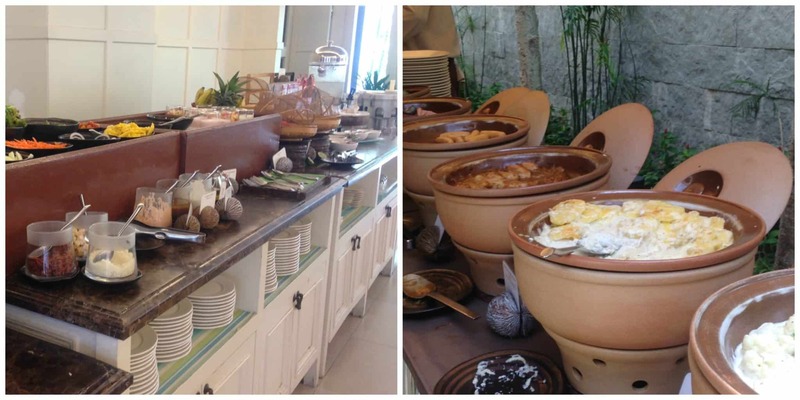 From fresh fruit, pastries and cakes; to full English favourites and eggs made to order; to iced coffees and fried rice and noodles – it was impossible to make a decision on some days. 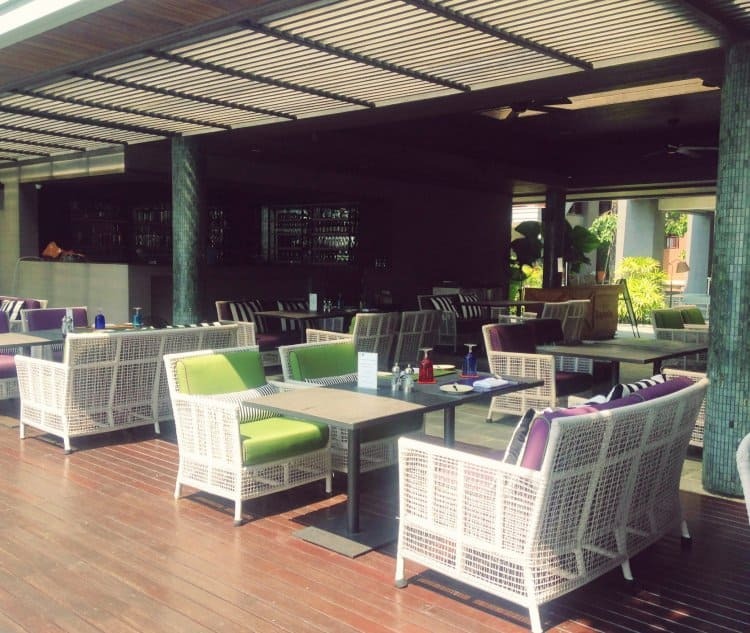 Monkey, funnily enough, gravitated towards the chocolate pancakes and waffles every day… The Rest Scene situated by the pool offered up both Thai and Italian cuisine, as well as a children’s menu. 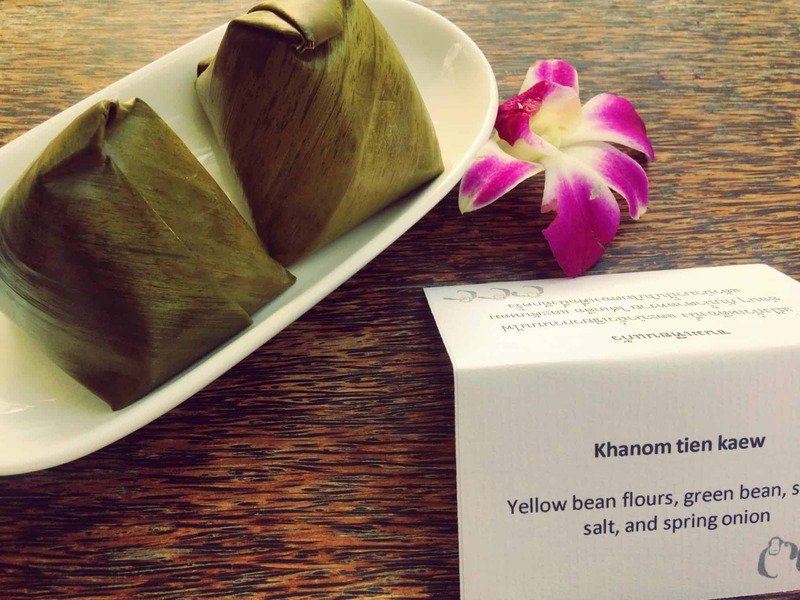 Their papaya salad and Tom Yum prawn soup were delicious, and I know Monkey enjoyed the fish and chips and spaghetti bolognese – all freshly prepared in an open kitchen. They also offered the yummiest sweet goods such as cream cakes and ice-cream, available all day. Price-wise it was expensive in comparison to outside establishments, but for ease, it was great to have the option to ‘dine in’. Meanwhile, there are bikes available for guests to use; private dining options; room service; organised day trips if should so wish; laundry service; free bottled drinking water, replenished every day in our room; and free wifi throughout the hotel including our rooms. Okay, so there may not have been a kids’ club (they’re planning on building one later this year) but little people are made to feel very welcome. From the high chairs and baby cots on loan to babysitting services, we were surprised by how the staff enjoyed chatting to Monkey – offering him toys to play with as well as their time. 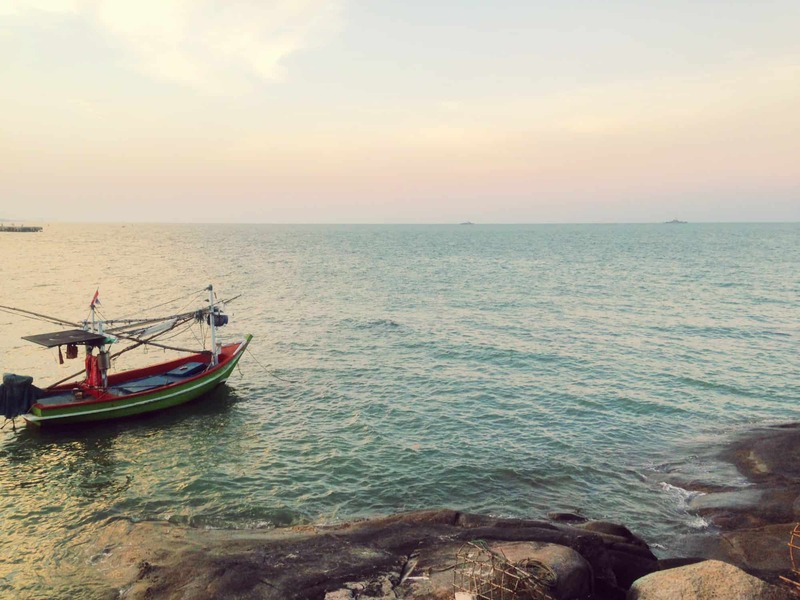 I was concerned that guests would be irritated by a noisy three-year excitedly running about the place especially as the Rest Detail Hua Hin is all about calm and serenity. But I needn’t have worried. We certainly didn’t feel out-of-place as there were plenty of families with young children. But while I may give the impression the hotel was a crèche… far from it. We often wondered where everyone had got to, as, after breakfast, we seemed to be the only ones there. What I was most impressed by – apart from the beautiful grounds and outside space – was that the small details mattered. When we checked out, the manager let us stay in our room for longer after ringing up our new hotel and telling us it wouldn’t be ready until the afternoon. He insisted we didn’t have to book a taxi, either, because we could hitch a lift with the shuttle bus. Nothing was too much trouble for the staff: we were greeted warmly at every opportunity, from the maids who cleaned our room spotlessly to the chefs at breakfast, who remembered how we liked our eggs. Every afternoon, treats from cookies to fresh fruit were left in our room; and on our wedding anniversary, they brought us a homemade cake – a lovely gesture. Would we go back again? Most definitely. 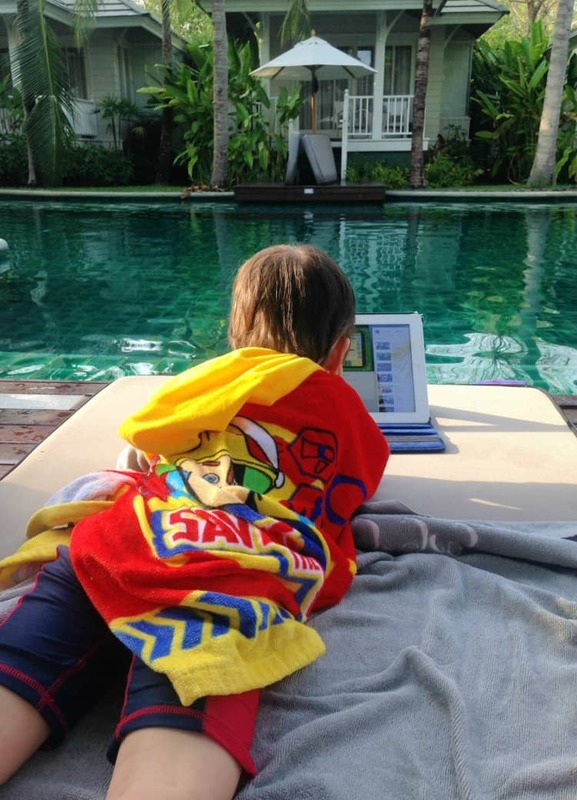 We haven’t stayed in a boutique hotel for some years – as we never really thought it was possible to combine a good value, luxury holiday with a toddler. But we couldn’t have been more wrong. Good to have Dex (monkey) for a couple of hours yesterday. He is a lovely,lively, outgoing lad. Spike and Zach always love seeing him, so we hope they’ll get together in a couple of weeks during half term. 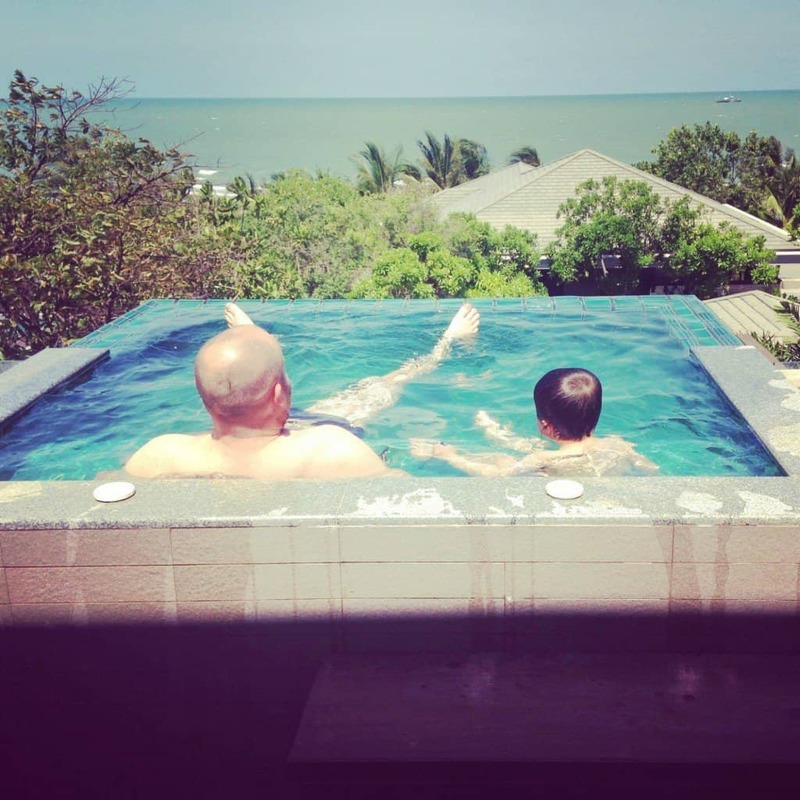 Your Thai holiday sounded great, much nicer than my golfing week there a few years ago in Pattaya, the whole place being like one mighty brothel – men only, NOT for families! Thanks Merlinda, we’re very lucky to be able to go somewhere so nice! Looks gorgeous – that logo would have had me hooked too, it’s fabulous. Everything about this place looks amazing and I just love all the little touches for children, lack of a kids club wouldn’t bother me, we never go for them but it seems like they have thought of everything else. What is it about Monkeys? I love them 🙂 We didn’t feel the need for a kids club but it will be an added plus point for the future! The room, the swimming pool, the buffet… everything sounds fabulous ! What a lovely place ! Ok, I’m not really jealous! Sounds like a fantastic hotel and a great holiday. I’m not sure we’ve ever been on a luxury holiday, definitely not since we had kids! What a luxurious hotel! Would love to stay there. The view, the pool, the big comfy bed, and that they even had bathrobes, slippers and flip-flops in Monkeys size is impressive! I reckon you’d love it! I didn’t think we could mix the two either, but just goes to show – also the Thais just love children.